If you are interested in being notified about any future trips, please contact us! This helps us reserve seats from various departure cities! Call 763-420-1074 or email cavinspilgrimages@gmail.com. The pilgrims have returned from their travels safely and thankfully no weather delays! Sorry that we didn't get pictures posted in a timely way, but now we have added photos to the posts. Thanks for following! Elah Valley, Emmaus, Jaffa ~ After we checked out of the hotel, we began our last day in Israel. We traveled through Old Testament lands to the Elah Valley where David slew Goliath (Samuel 17.) Mass was at a site associated with ancient Emmaus, the Roman city of Emmaus Nicopolis, where we remember how Jesus’ revealed Himself to those who walked on the road to Emmaus (Luke 24:13-35.) Our last visit was to the ancient port of Jaffa (Joppa.) This is the city of Jonah’s defection (Jonah 1:3) & Peter’s vision (Acts 10:5-9) at the home of Simon the Tanner- one of the oldest cities in the world. It is a city of partings & departure & is where we said good-bye to our guides & drivers before heading to the airport. Today we returned to the area of the Dead Sea, stopping at En Gedi where Jeff taught about that location where David hid from Saul (1 Samuel 26,). Next we headed to Masada, the wilderness palace fortress built by Herod the Great. The final suicidal stand of the Jews against the Romans took place here in 73 AD. We took the gondola to the top where we toured this amazing site & heard the even more incredible story. After a lunch stop we continued north for mass at Qasar El Yehud, renewing our baptismal vows at the wilderness part of the Jordan River where John the Baptist baptized Jesus (Mark 1:9-11.) We ended the afternoon at a Dead Sea beach to take a float in this unique body of water. The mineral rich waters are so buoyant that it seems more like bobbing than floating! Tonight was our farewell dinner and each bus presented a song or skit to prove they were the best bus. This year, blue bus wins! Free day. Pilgrims decided whether to rest in the hotel or explore Jerusalem. Some pilgrims returned to Bethlehem to visit once again. St Anne’s Basilica & the Pools of Bethesda, Southern Steps of Temple Mount, Mt Zion, Caiaphas’ house ~ This morning we started out at the Church of St. Anne where the acoustics make songs echo beautifully. From there we made our way to the Southern Steps of the Temple Mount and Jeff gave a teaching about the Jesus writing in the dust. We visited the Western Wall and walked through parts of the Old City of Jerusalem before exiting through the Dung Gate to Mt Zion for Mass at the church that recalls Peter’s denial on the night Jesus was betrayed, St. Peter in Gallicantu (Matthew 26:69-75.) The church is built over the High Priest Caiaphas’ home (Matthew 26:57,) where Jesus was held that same night. Mount of Olives, Church of the Ascension, Dominus Flevit Chapel, Gethsemane, Kidron Valley, Mt Zion, Upper Room, Israel Museum, Shrine of the Book, Model of 1st Century Jerusalem ~ A group of early birds walked to the Church of the Holy Sepulchre before breakfast. Then all together we viewed Jerusalem from the top of the Mount of Olives, and then walked down along the Palm Sunday way, stopping at the Dominus Flevit Chapel, a name referencing “Jesus Wept” (John 11:35). At the base of the Mount we entered the Garden of Gethsemane (Matthew 26:36) & the Church of the Agony (also known as the Church of All Nations), where we attended mass at the rock where Jesus prayed before He was taken. Next we visited the excavations of the City of David near the Temple Mount and saw David's Palace and walked through a Canaanite Tunnel and out to see the Pool of Siloam. Tonight Emily taught again on the Church of the Holy Sepulchre, including the history & layout of this important structure. The remaining 2 coaches had the opportunity to tour the Kotel or Rabbinical Tunnels. Mt Tabor, Bet Shean, Judean Wilderness, Qumran, Inn of the Good Samaritan, Jerusalem ~ After an early start, we ascended Mt Tabor for mass in the lovely Basilica of the Transfiguration, the site of Christ’s Transfiguration (Matthew 17:1-13; Mark 9:2-13; Luke 9:28-36.). Then we departed the Galilee through the Jordan Valley. We toured Bet She’an, a Roman city that has been restored enough to see the excavations of the streets & shops as they originally were. It lies beside the Old Testament tel (Joshua 17; Judges 1; I Samuel 31:10-12) from the days when Saul was king. We stopped at Qumran, to see where the Dead Sea Scrolls were found, before we turn west toward Jerusalem. Our first view of the Golden City was from a promenade where we will shared the traditional Jewish Shechuyanu blessing with bread and wine and the view of a beautiful sunset. Capernaum, Tabgha, Primacy of Peter, Mt of the Beatitudes, Caesarea Philippi, Tel Dan, Mt Hermon, Golan Heights, Sea of Galilee ~ We started the morning with a visit to Church of St. Peter’s Primacy along the sea shore and prayed a blessing over our priests and deacons. Then we toured Capernaum and also had mass at the Church of St. Peter built over his house and then had a time for praying for the sick. After a talk by Jeff in the ancient synagogue, we drove north to Caesarea Philippi, where Peter first identified Jesus as the Messiah & Jesus announced Peter's role in the church (Matthew 16:17-19.) We took a quick look at the ancient gates of the city at Tel Dan and returned to the Sea of Galilee to the Mt of Beatitudes, the site of Jesus' Sermon on the Mount. After dinner we had the opportunity for confessions with our priests. Nazareth, Cana, Kfar Kedem, Ancient Boat ~ Today we toured the area west of the Sea of Galilee. We began at the Church of the Annunciation in Nazareth & the Grotto of the Annunciation, thought to be Mary’s girlhood home, before mass in the upper level church. We visited Joseph’s workshop beneath St Joseph’s Church. 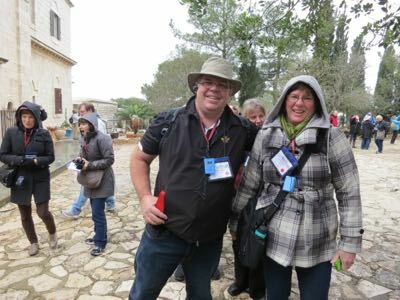 Not too far away, we visited Cana, where Jesus performed His first recorded miracle at the wedding feast (John 2:1-11,) turning water into wine. Couples renewed wedding vows in the church. AtKfar Kedem we experience life firsthand in the time of Jesus. We ended the day with a sunset cruise on the Sea of Galilee. It was quite windy and took a while to cross it, but it reminded us of the storm that Jesus calmed in Matthew 8:23-27. Caesarea, Mount Carmel, Megiddo, Sea of Galilee ~ This morning we experienced our first Israeli buffet breakfast. It is a feast of cheeses, yogurts, fish, eggs, raw vegetables, fresh fruit, cereals, wonderful breads & unique Israeli dishes. We may find that lunch is not much of a need after an Israeli breakfast! We drove north from Tel Aviv along the coastal plain of the Mediterranean Sea. We began our tour of Israel in Caesarea Maritima where Cornelius, the centurion, was baptized as the first Gentile convert (Acts 10). It is also where Paul was imprisoned before traveling to Rome to appear before Caesar (Acts 23-26.) In Caesarea, Jeff gave a teaching in the Theater. Each group, divided by motor coaches, toured the archeological site with their Israeli guide. Next we drove up the coast to Mount Carmel. The Carmelite monastery is built on the traditional site where the prophet Elijah slew the false prophets of Ba’al (1 Kings 18.) Then we traveled on to the region of the Galilee for Mass was at the newly opened site of Magdala, home of Mary Magdalene, on the shore of the Sea of Galilee. Arriving Pilgrims from New JerseyTonight we will all meet up at the hotel in Tel Aviv for mass and orientation time. Though there was a little snow storm in Jerusalem, there is no snow in Tel Aviv and by the time we get to Jerusalem in a few days, it will long be melted. Tomorrow the tour day starts for nearly 200 excited pilgrims on 4 separate coaches, each with a terrific Israeli guide and at least one priest. 995 2485 from Jeff Cavins on Vimeo. All January pilgrims should be recieving an Israel Study Manual. To help familiarize you with it, Emily interviews JoAnn Magnuson about the manual she has compiled. We are excited about the upcoming pilgrimage this January! Departing Jerusalem, we head east through the Judean Wilderness. We cross to Jordan via the Allenby Bridge. ~ Upon entering Jordan, we go to the biblical area of Moab. It is mentioned often in the Bible but perhaps most known from the book of Ruth where Elimelek & Naomi live after their sons marry Moabite women, Ruth & Orpah (book of Ruth). ~ Our goal is Mt. Nebo, the mountain from which Moses viewed the promise land (Deuteronomy 34:1-6.) If the day is clear, we have a panoramic view of the Holy Land. 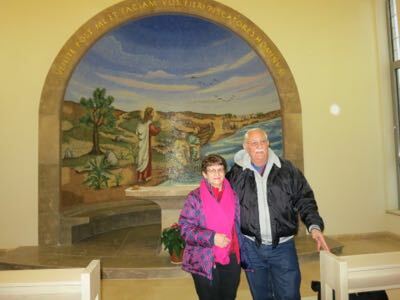 ~ Then to Madaba, the "City of Mosaics." Dating from early times, Madaba is mentioned in the Old Testament as a border city of Moab (Numbers 21:30; Joshua 13:9.) We visit St. George's Church which preserves a mosaic map of ancient Israel, the famous 6th century map of Byzantine Jerusalem, reproduced in the Cardo in the Old City. Many beautiful mosaics have been unearthed throughout the excavation. ~ Tonight we are on the east shore of the Dead Sea. The resort hotel has warmed Dead Sea water pools for us to experience the buoyant waters. Today we travel through Old Testament lands to the Elah Valley where David slew Goliath (Samuel 17.) ~ Mass is at a site associated with ancient Emmaus, the Roman city of Emmaus Nicopolis, where we remember how Jesus’ revealed Himself to those who walked on the road to Emmaus (Luke 24:13-35.) ~ For those on the FOCUS tour, this is the last stop: a visit is to the ancient port of Jaffa (Joppa.) This is the city of Jonah’s defection (Jonah 1:3) & Peter’s vision (Acts 10:5-9) at the home of Simon the Tanner. It is the oldest port in continuous use in the world. Today it is a charming artist community. Its setting gives us a sense of the ancient Middle East we came to see.